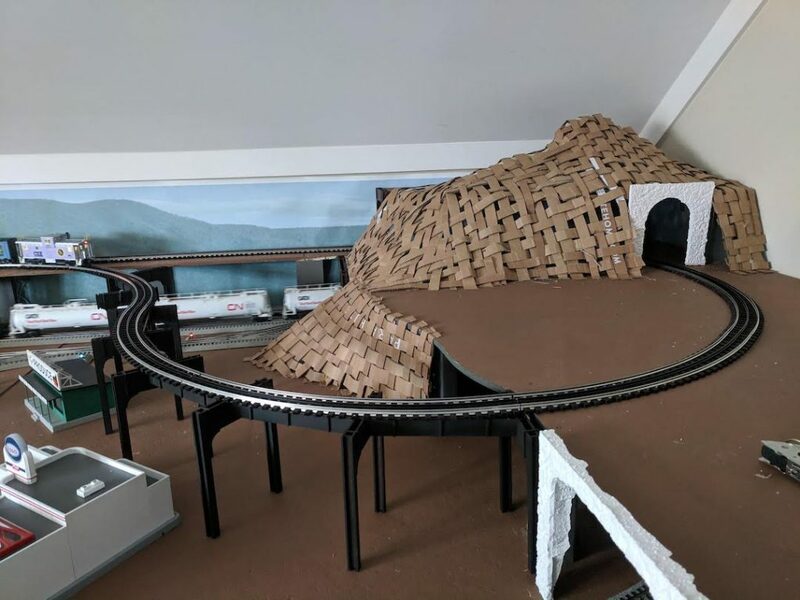 We’ve made some progress over the past couple of weeks working on Slottown – in large part due to having a bit of time off work for the holidays, as well as having some cold, wet weather, layout building and train running has been high on the agenda. 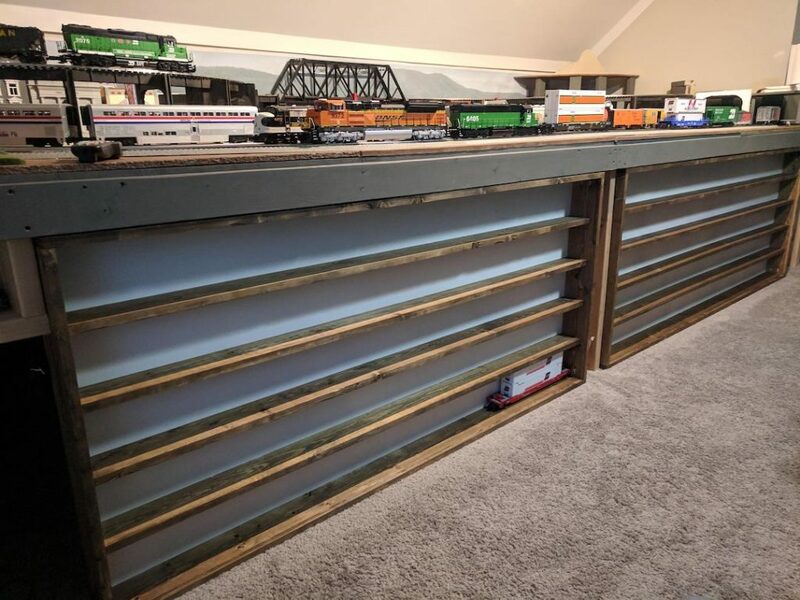 First up, I built some display shelves to line the layout and store unused rolling stock and locomotives. 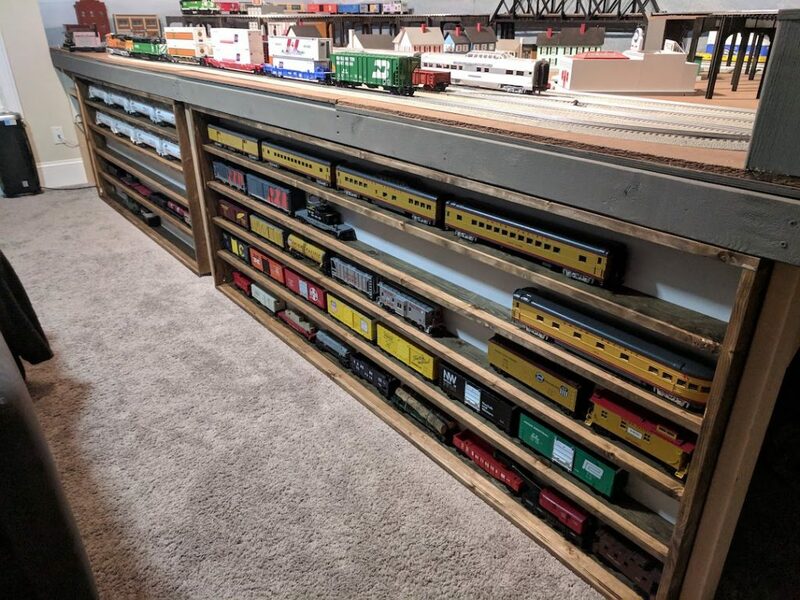 This was my first attempt at building proper display shelving and I had quite a bit of assistance from a fellow model railroader, Shop 13. He was kind enough to lend me his tools, time, and most importantly, his expertise to help me build my display cases. 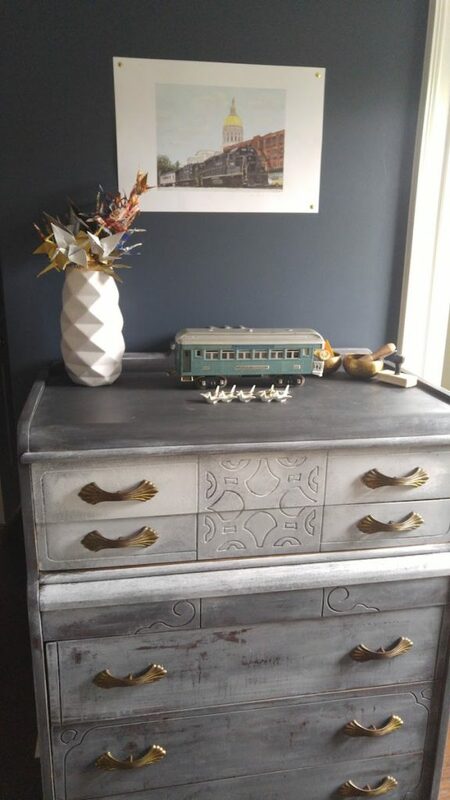 We sourced our wood from the local big box store, where the frames are made from 1x5x8 pine, the shelves out of 1x4x8 pine, and the rear backing using 1/4″ thick sanded plywood. We used a table saw to cut two 1/8″ thick grooves 1/4″ apart on each 1×5, which will eventually be the “tracks” for clear acrylic sheets that will slide back and forth as transparent doors. We then used his mitre saw to cut each piece to length, then finally we used his Kreg system to create pocket screws to better conceal the screws and ensure 90 degree joins. 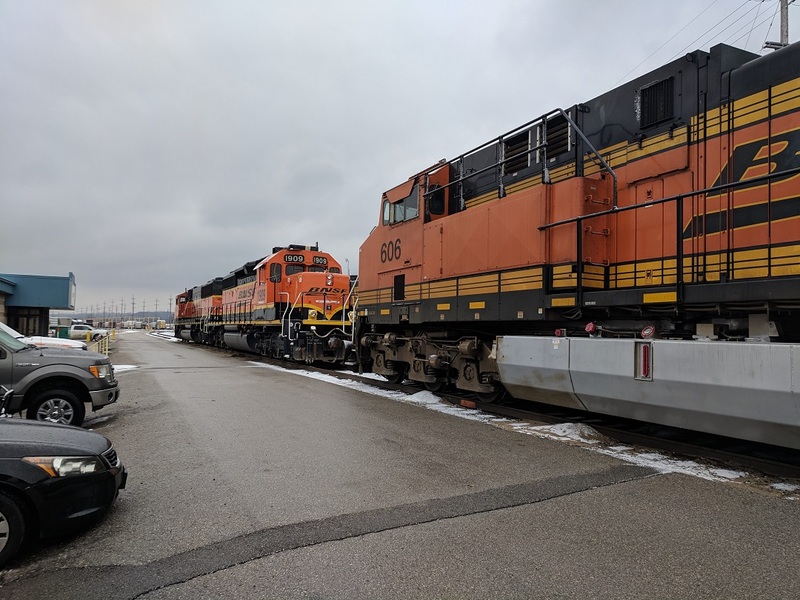 In mid-December, I had the opportunity to head out to Kansas City, MO for BNSF to install some IT equipment in their Kansas City intermodal yard which will host workloads that control some of the container cranes. 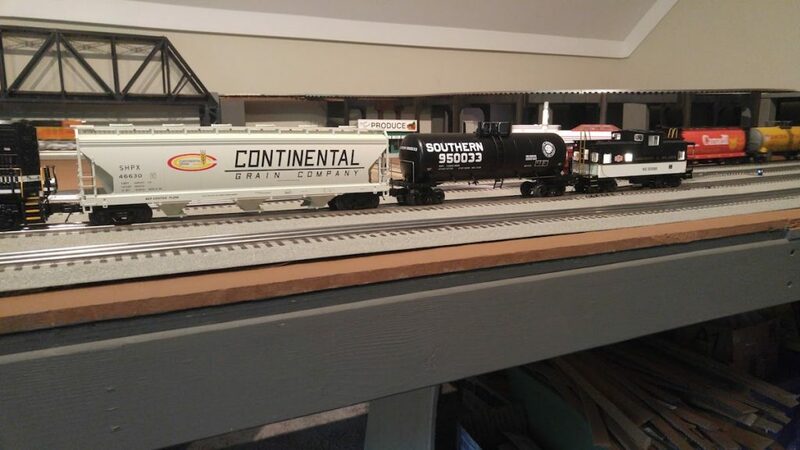 As part of the visit and because they know I am a train nut, the customer organized a yard tour of both their Argentine hump yard and the LPKC intermodal yard. 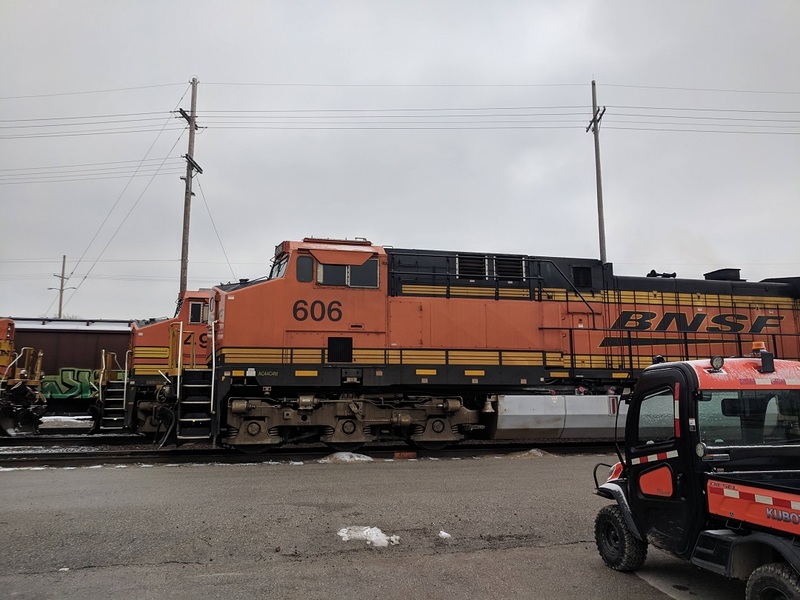 Since I am not a BNSF employee and have not undergone the mandatory safety training, I was not able to actually get on or in any of the locomotives or on the track in the yard, so most of my photos were from inside the vehicle. 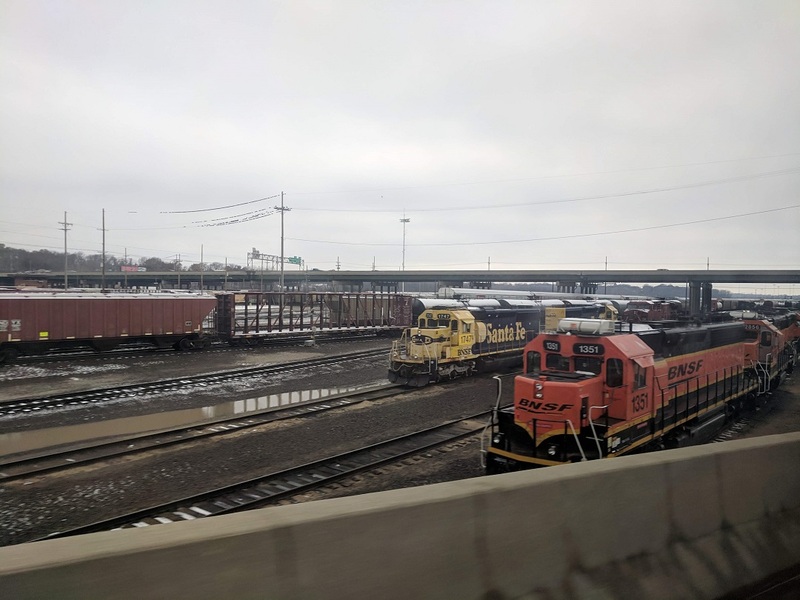 The hump yard was super interesting – the entire yard from the hump down to the sorting tracks is completely automated. 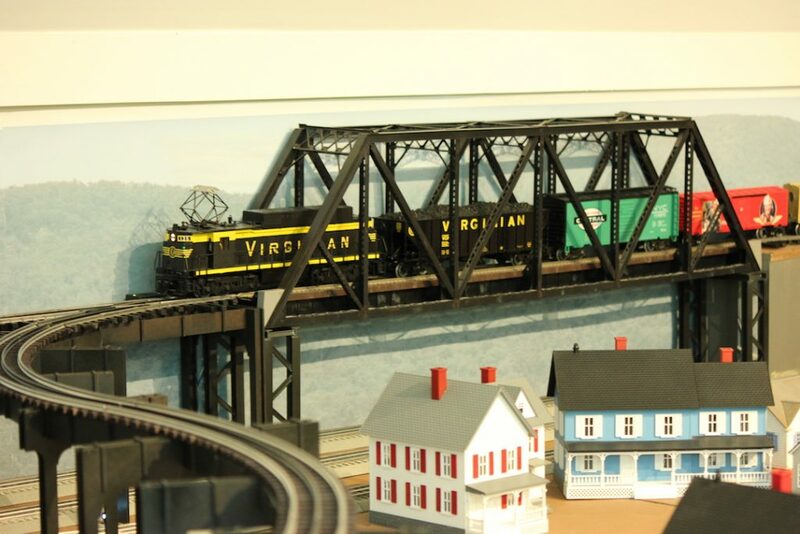 As the cars approach the hump, each freight car is identified via an RFID identification tag. 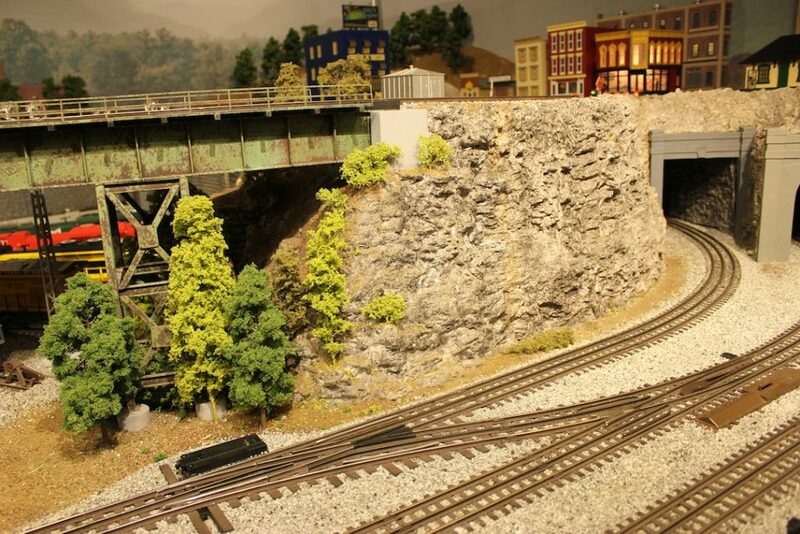 Any unreadable or unidentified cars are sorted to a designated inspection track to the side of the yard. All cars are then weighed and counted, then released at the top of the hump. Gravity does all of the work from there on out along with a series of retards that “pinch” the flanges to slow the cars down. 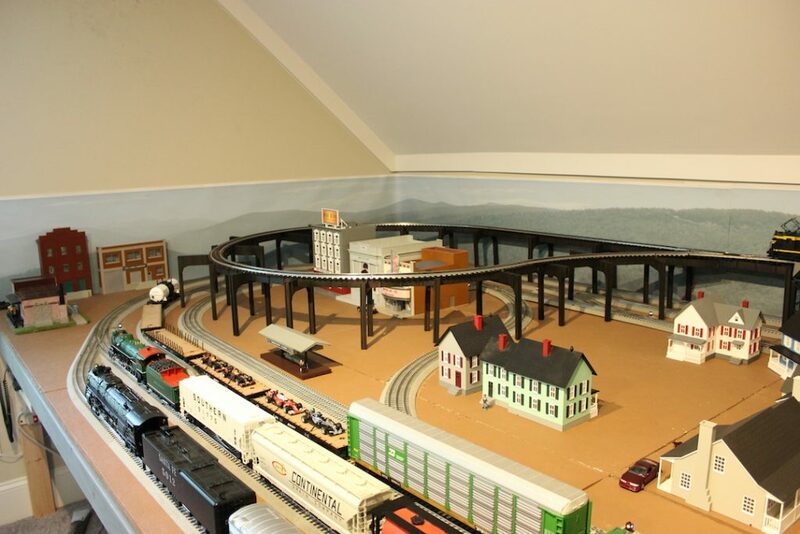 The car(s) need to end up on the correct sorting track and ideally at a coupling speed of 3-5mph, which is a function of car weight, number of curves where the cars may lose momentum, distance for which the cars need to travel (as sorting tracks fill up when they build trains, the distance reduces). 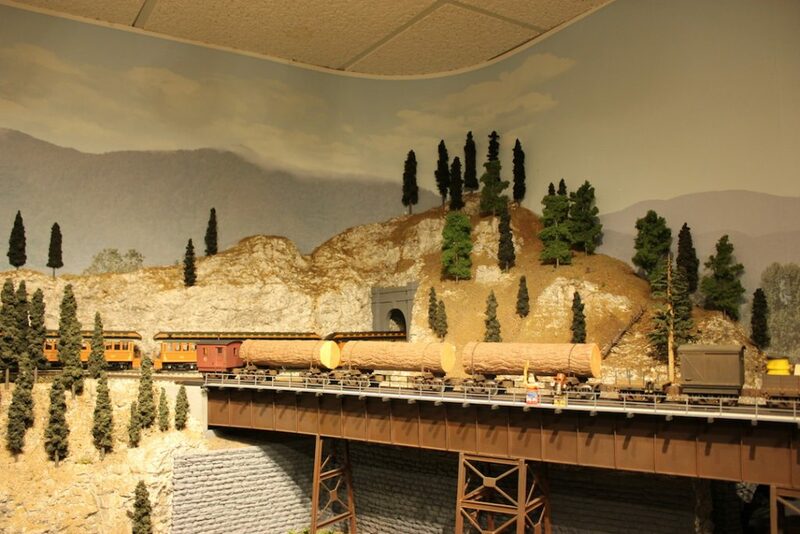 They measure where the last car on the sorting track using electrical signals through the rails. 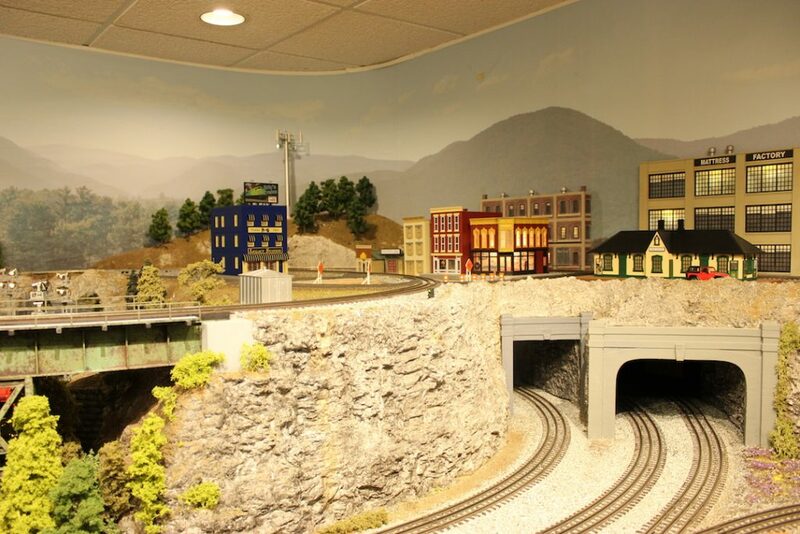 The last car’s trucks “short” the signal and the distance along the track can be calculated. 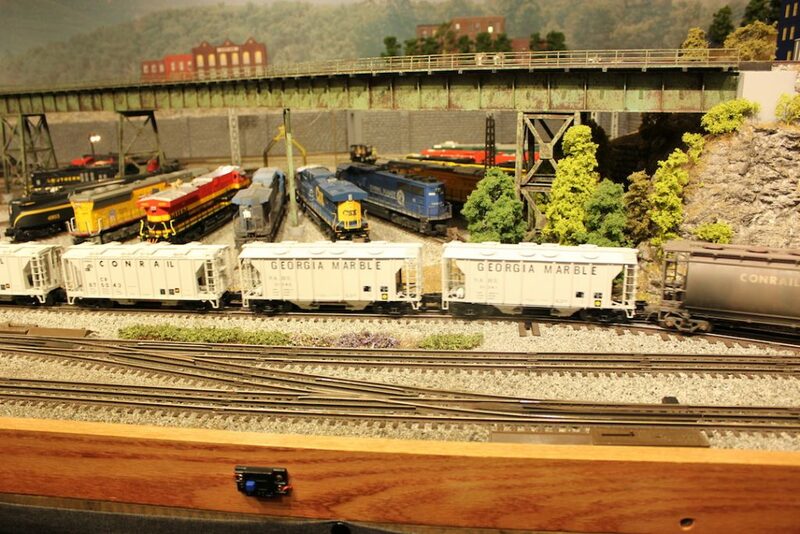 The yard and hump is graded and surveyed extremely accurately, so the system “knows” the speed at which the car(s) need to travel through the yard and when they should reach each checkpoint, however other factors such as wind speed and direction, precipitation, load aerodynamics, wheel bearings, etc can result in the car(s) deviating from the ideal speed based on the algorithm. 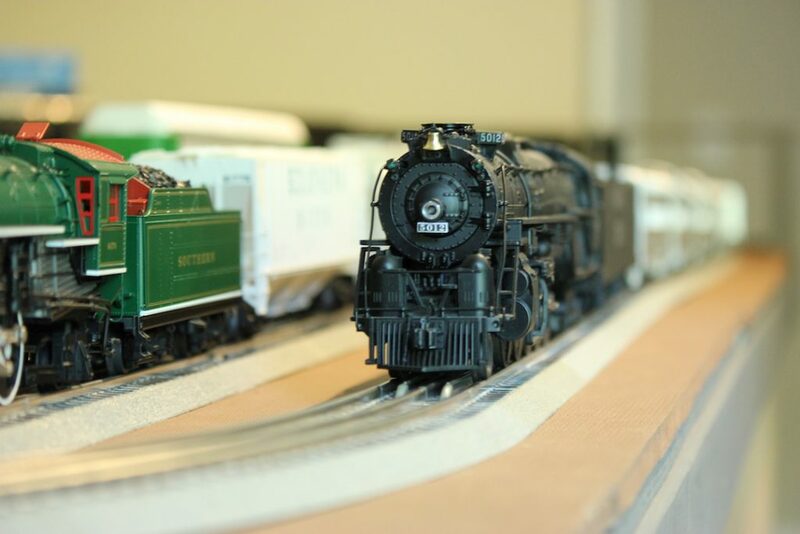 As the car(s) move through the yard, their speed is measured at set points using radar (similar to what Police used to use before switching to laser speed detection), and the appropriate amount of force applied to the retarders is calculated to determine how much speed to shave off. Note that cars can only be slowed down (never sped up) so it’s critical that no more than necessary is shaved off. The yard control system is so intelligent that the retarders are actually applied while the wheels are moving through them at different times to even the wear on the retarders themselves. 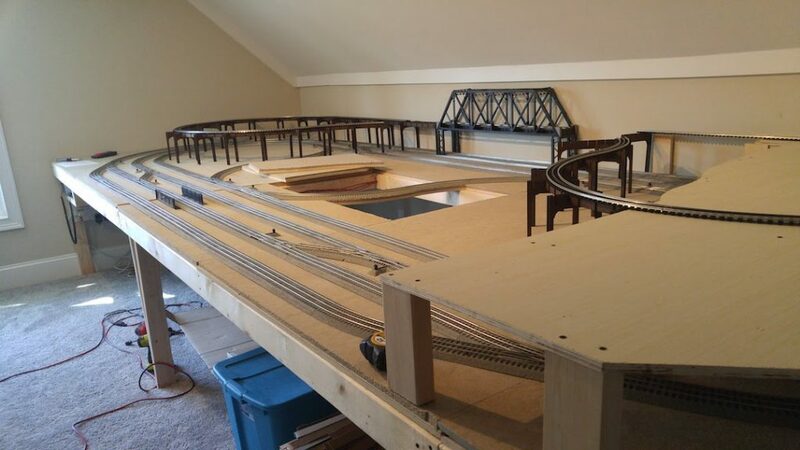 If all goes expected (which happens the vast majority of time), the cars are sorted into the correct sorting track, couple at around 5mph (although admittedly they have tolerances up to 7, since it’s better to err on the side of speed) and trains are built. 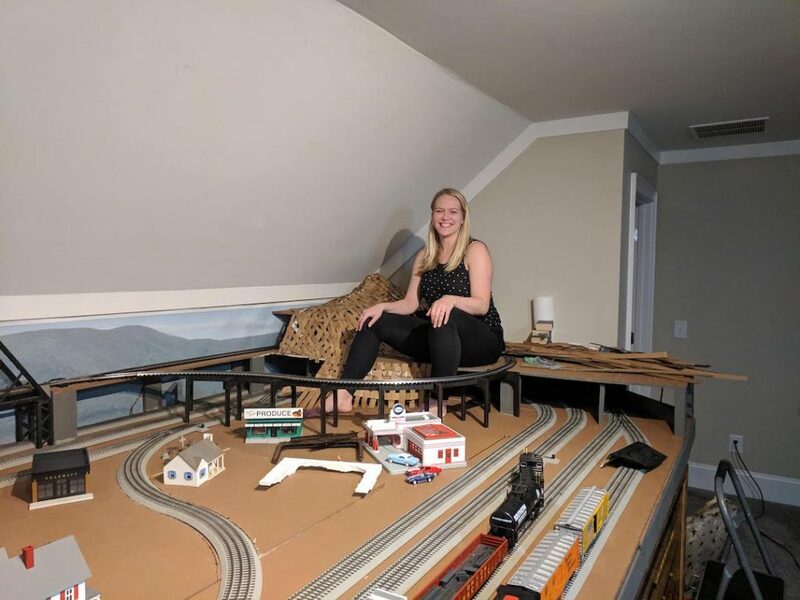 In the event that a car is sorted incorrectly (less common), a knuckle left closed, or a brake was left on (more common), they will temporarily pause operations and send a switching locomotive out to move the car. 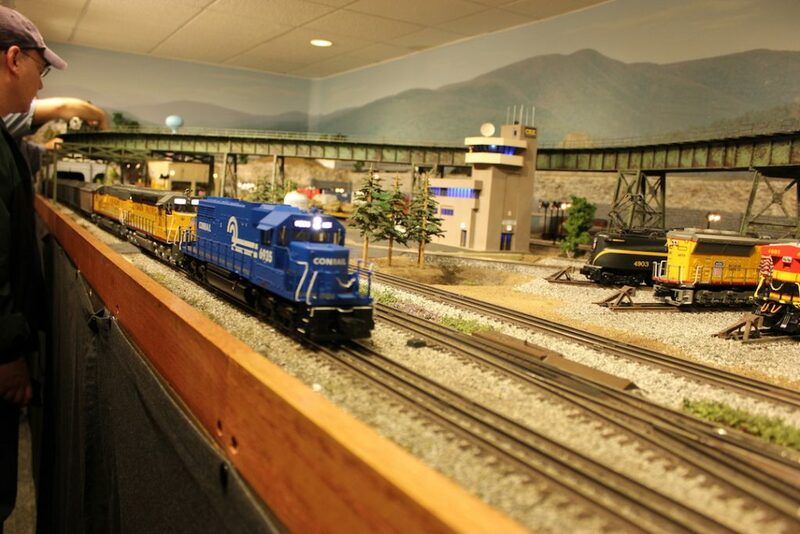 Most of the switching locomotives are remote controlled as well with a big remote that an engineer straps on and can control while on the ground. 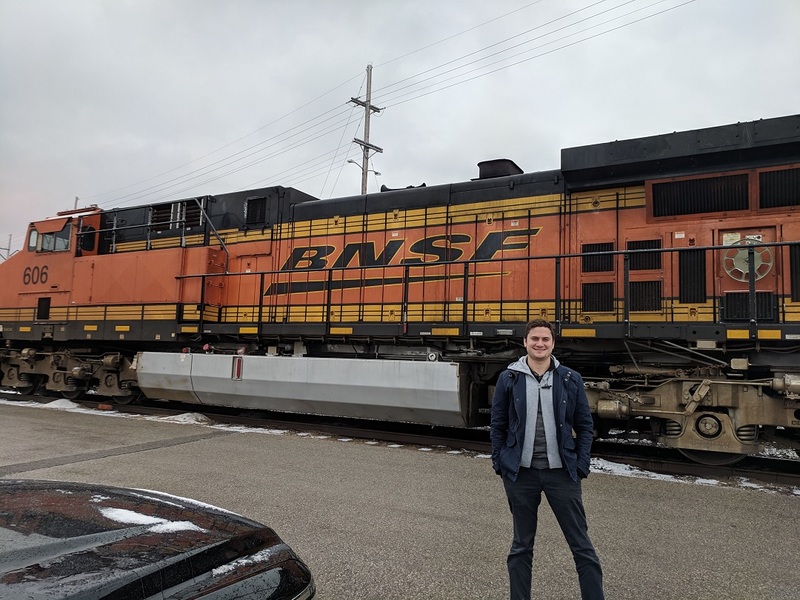 I wasn’t able to take any photos within the control room since the system is proprietary, but it also speaks volumes to BNSF as an organization – they deployed their own hump yard control system entirely in-house and the system is incredibly impressive. 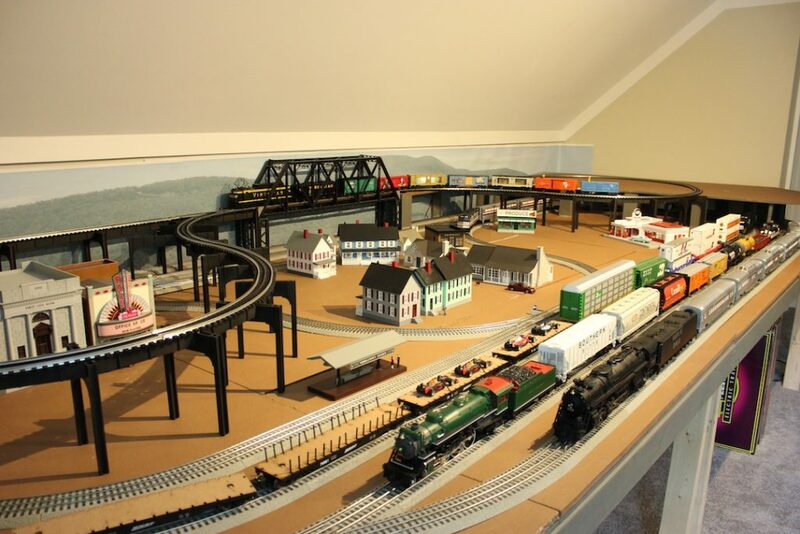 They are currently rolling out the updated system to hump yards across their trackage. 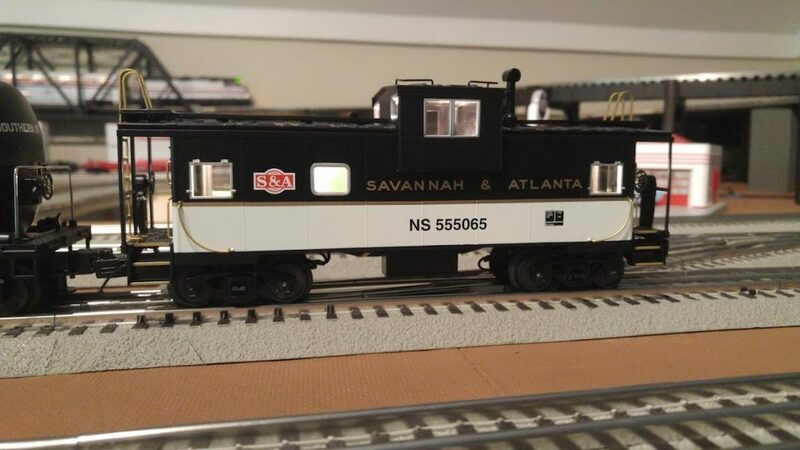 The downside of my “eBay special” is that for some odd reason the drawbar was missing from the locomotive. I followed up with the seller who was not able to locate the drawbar, so I had to fabricate my own. I went to Lowes to look for some brass or metal to make my drawbar but the best I could find was some ~1/16″ thick “welding plate.” I used a chop saw with a metal cutting blade to cut my plate into a rectangle (took far longer than I had hoped – chop saw was not ideal for the application but it’s the only heavy duty metal cutting tool I have as I didn’t thing the dremel would cut it (pun intended)). I then used my vice and a dremel to grind down the bar to the shape close to the MTH part, then I drilled my two holes in my drawbar, before giving it an even coat of black metal spray paint. 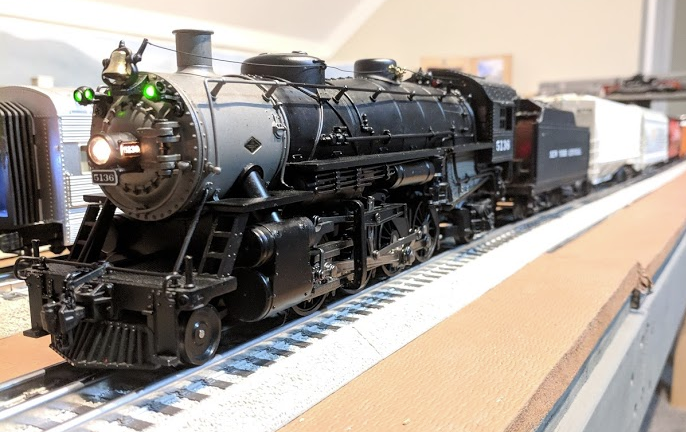 End result worked the charm, can’t even tell it’s not the original piece unless you pull it off the locomotive and inspect it. 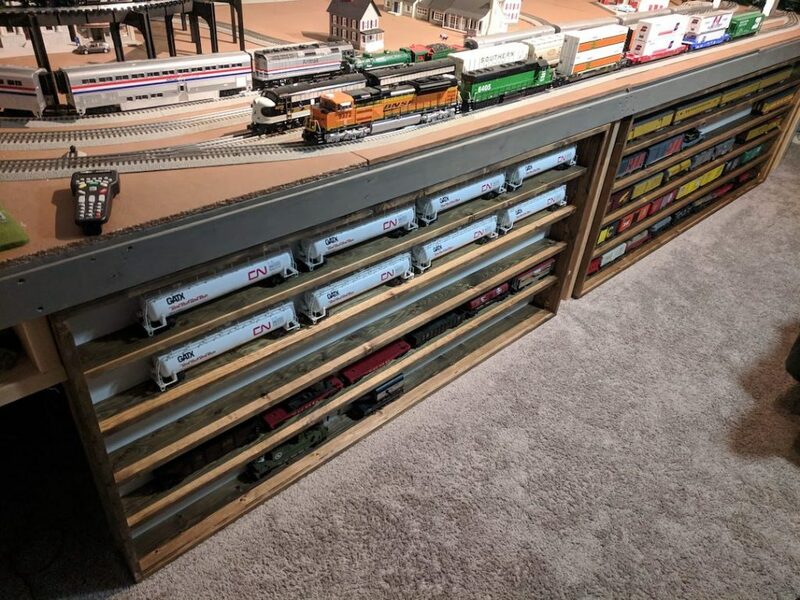 That being said, all told it probably took me about 1.5 hours worth of effort (not including the time spent milling around Lowes looking for materials). Would I do it again, I’d probably use ABS plastic from Plastruct or Evergreen… alternatively I do have a jig saw with some metal cutting blades, but I’m not sure the jig saw blade is substantial enough to cut through 1/16″ steel. 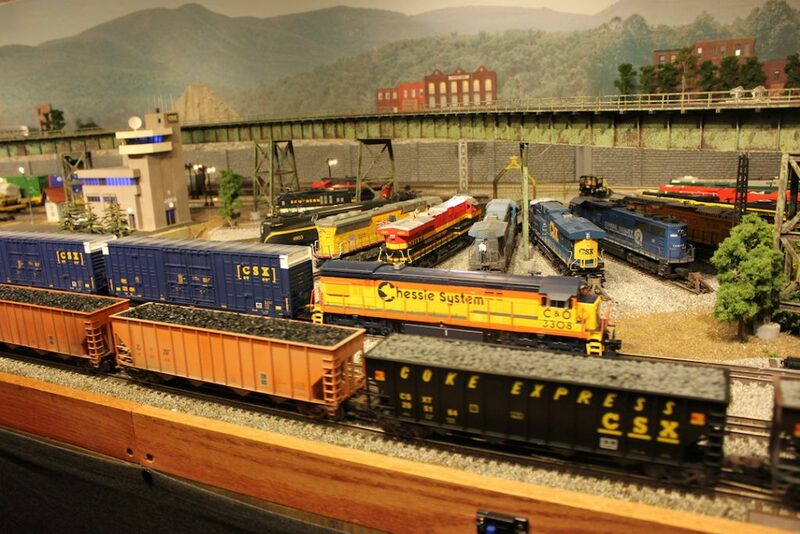 Slottown residents can observe the latest in locomotive pulling power with the recent acquisition of a CSX ES44DC. 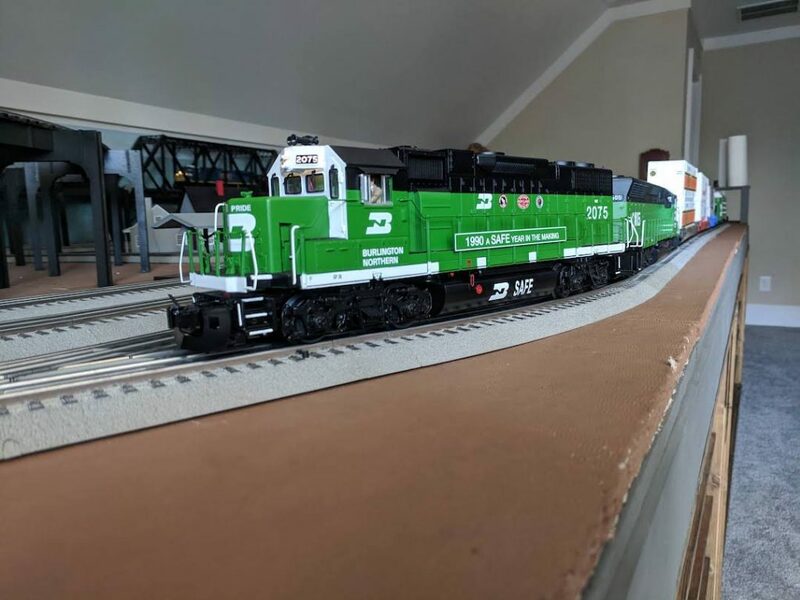 Modeled after what we used to see almost daily in real life by our apartment near CSX’s Hulsey yard in Cabbagetown (Atlanta), we can double-head the latest GE ES44DC along with an EMD SD70ACe to pull our modern freight trains. 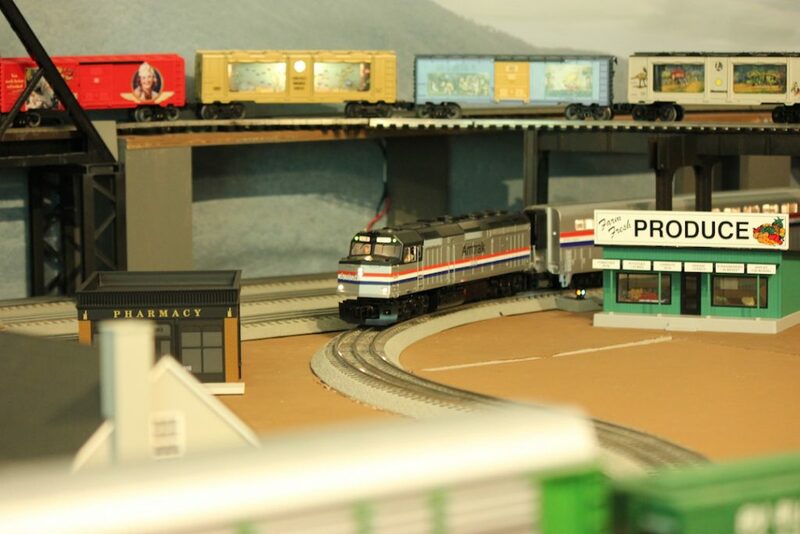 We were originally was using a Lionel ZW-C transformer with two 180 watt power bricks to power the layout, but given that we’re using DCS Wifi/WIU for most of train control, we didn’t really have a strong need for the throttles or buttons on the transformer and we don’t need the TMCC integration since track power can now be controlled via DCS – it actually became a bit of an annoyance since with throttles 1 and 4, every time we’d power the transformer up, we’d have to use the TMCC Cab-1 to “soft throttle” the voltage up. 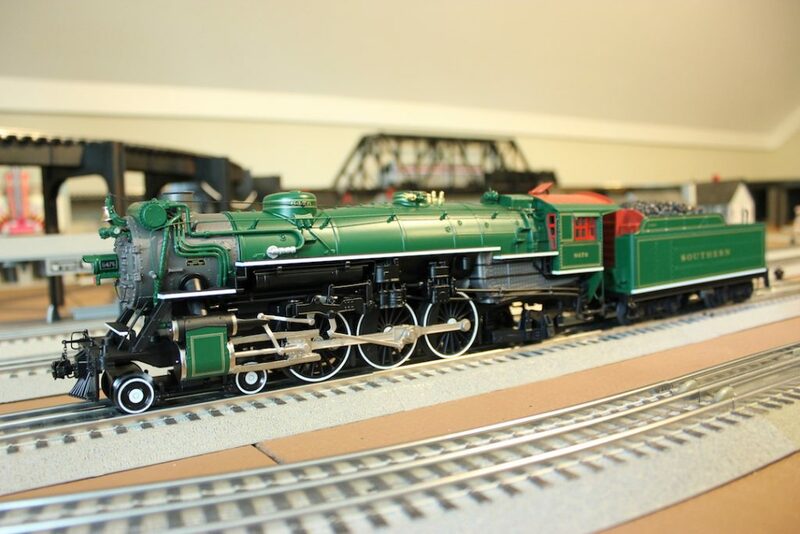 Furthermore, when I went to run some old PS1 locomotives, I found there was what appeared to be a DC offset where the horns would blow constantly, as described in this OGR Forum Post. 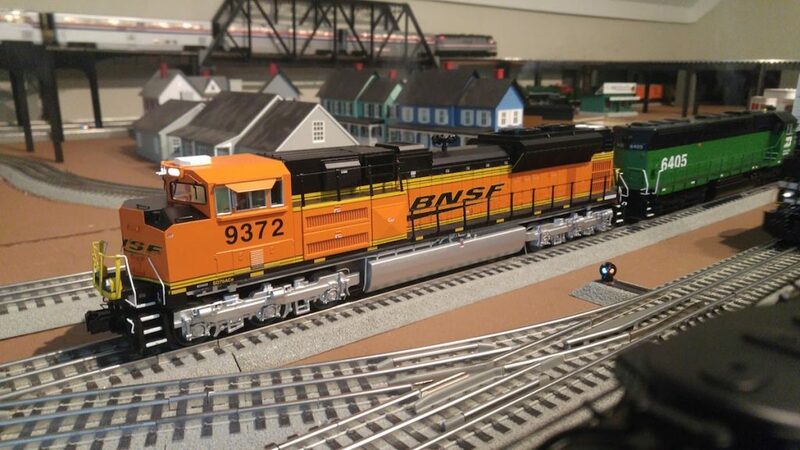 I considered splicing my 180watt power supplies directly into my DCS TIU as Eric notes in this YouTube video, but doing so would forfeit any traditional throttle control of the track power, and we found the MTH DCS Wifi App to occasionally require “refreshing” to control track power, so having a physical “fail-safe” would be beneficial. 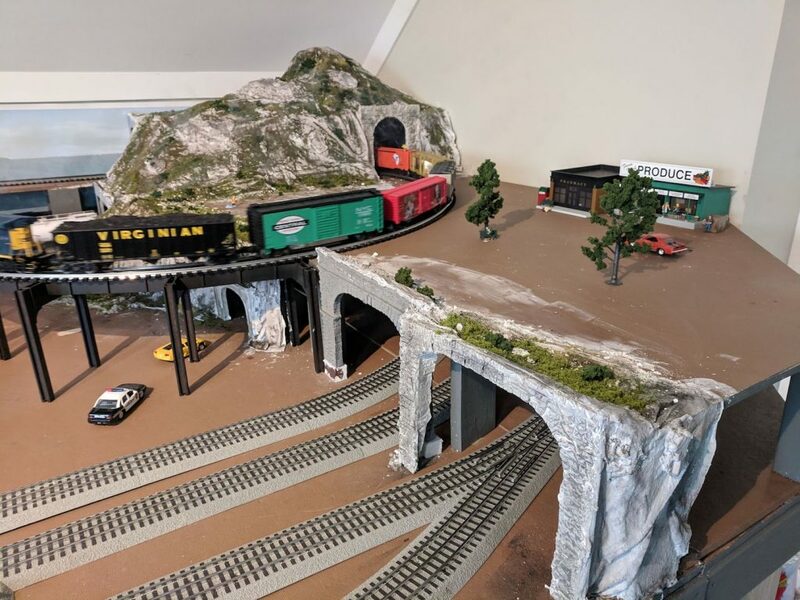 Additionally I’d lose accessory outputs, which means I’d have to rig up another separate transformer somewhere like Eric does on his layout, which is not what I wanted to do (we’re all about minimalism in Slottown). 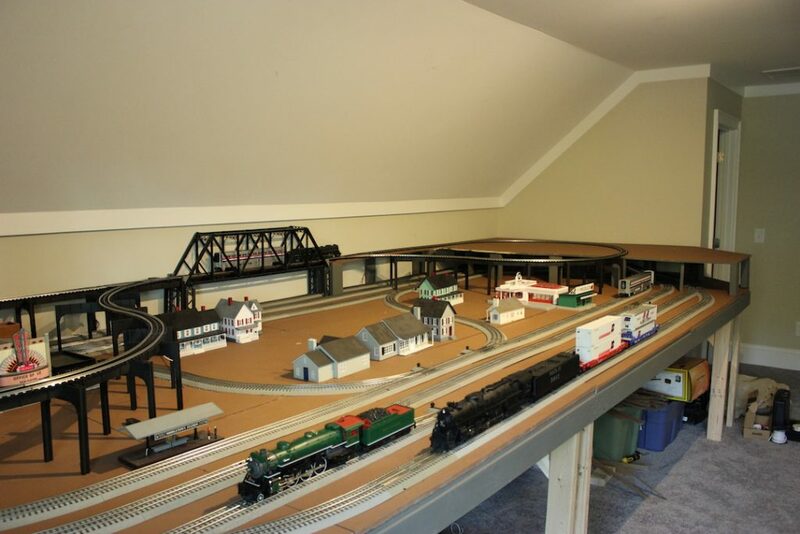 So after a bit of hemming and hawing, I decided to build a small shelf for an old MRC Dual Power O-27 I had in storage. 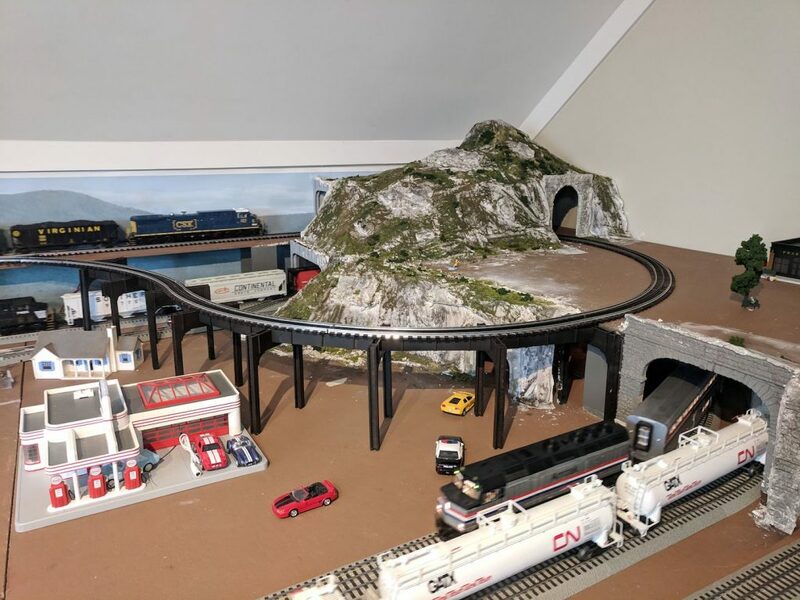 The benefit of the dual power is it’s low profile, still gives us the option of manual throttle control, and it has both constant 12v and 14v output for accessories. 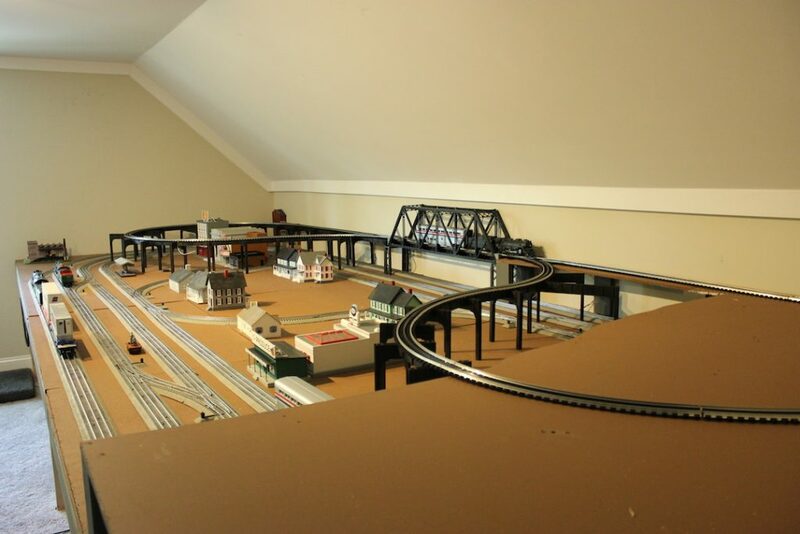 At 270 watts, it should be sufficient to power the whole layout, including accessories and trains. 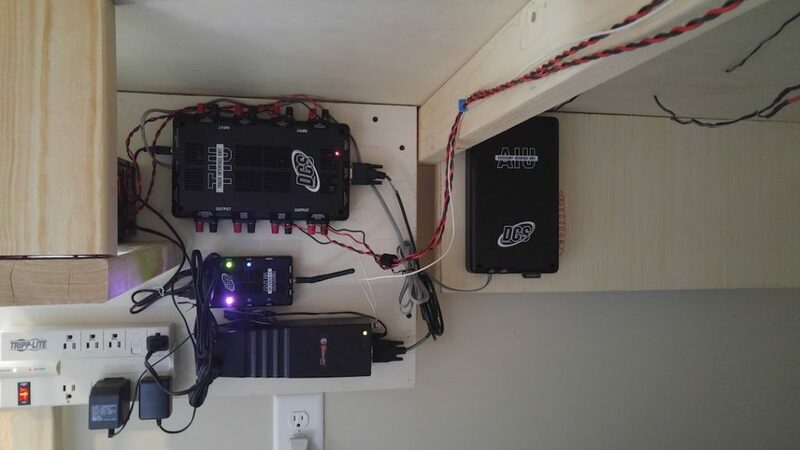 The only downside is there’s no easy way to wall mount it like my other control packs so it requires a shelf. 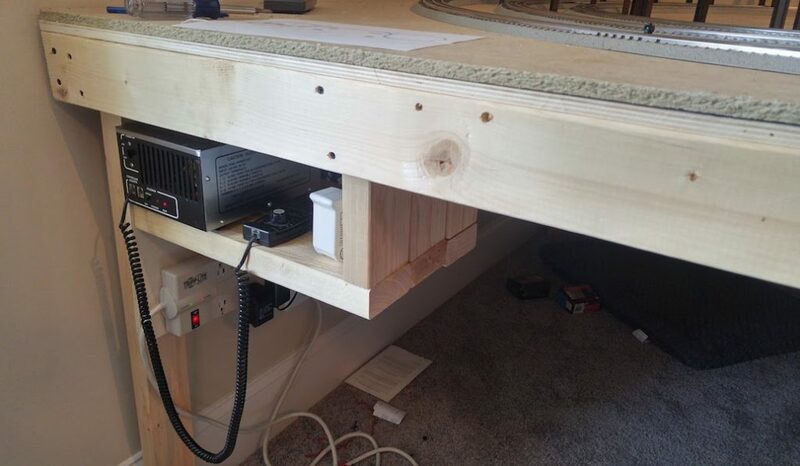 I had to temporarily disassemble the control board to secure the shelf, but ultimately I’m happy with the end result. 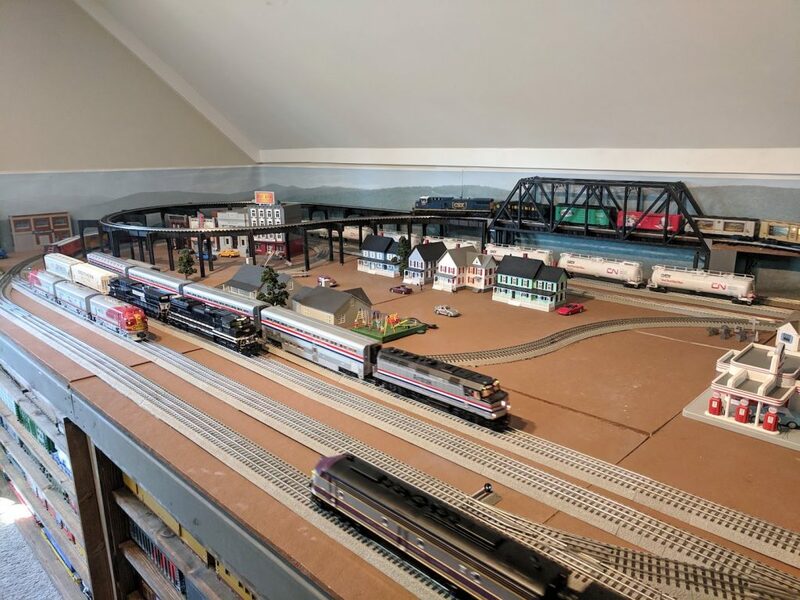 Lastly, I purchased a used MTH DCS AIU at a local train show this weekend, so I created a new mounting board for it and mounted it. 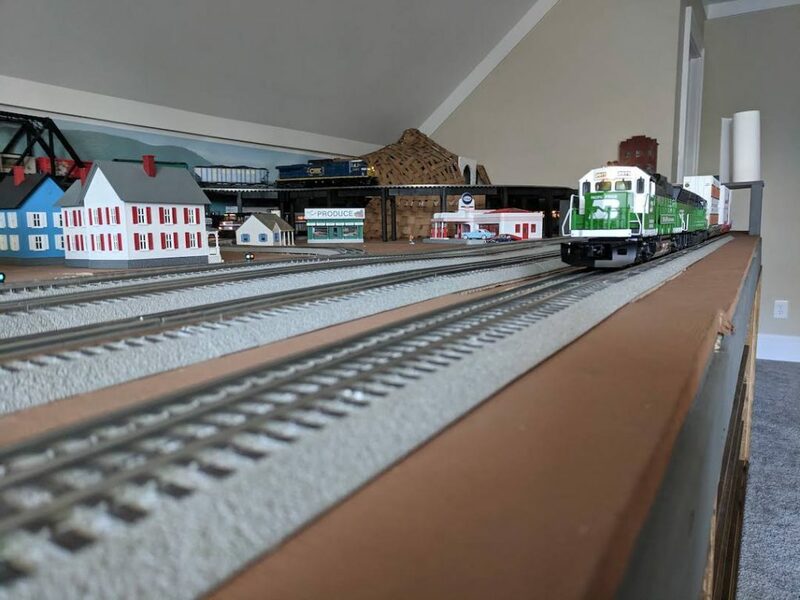 I did have to purchase a new TIU to AIU cable, since the included one from the factory was missing from my train show purchase, so I purchased a 6P6C reverse cable on Amazon. 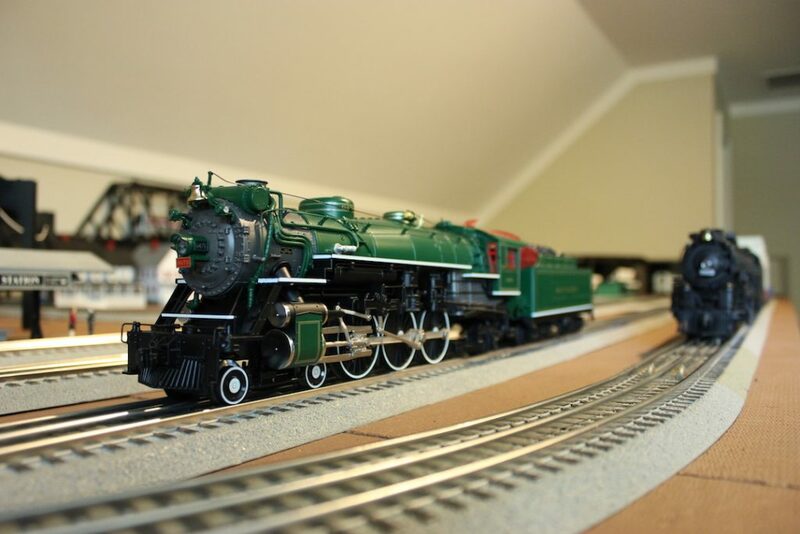 In retrospect, I wish I had just bought a new one at the store rather than save the ~$20, but it was an impulse purchase. 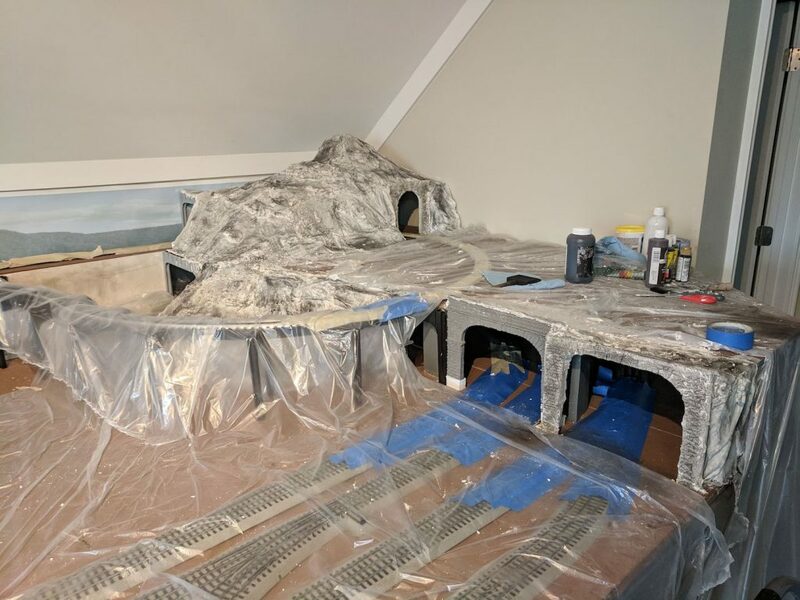 Next up, we’ll be removing everything from the table top and painting the homasote with brown latex paint to help seal out moisture and prepare for ballast and scenery. 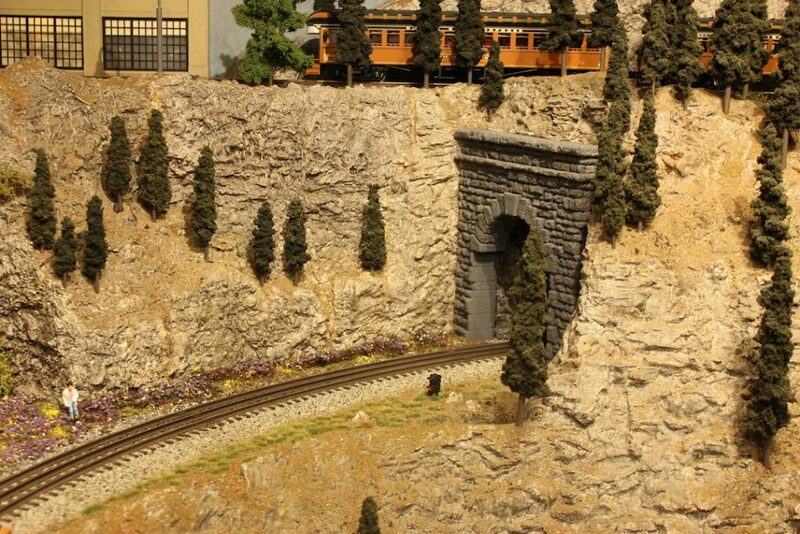 We’ve ordered 5 bags of Brennan’s Better Ballast. 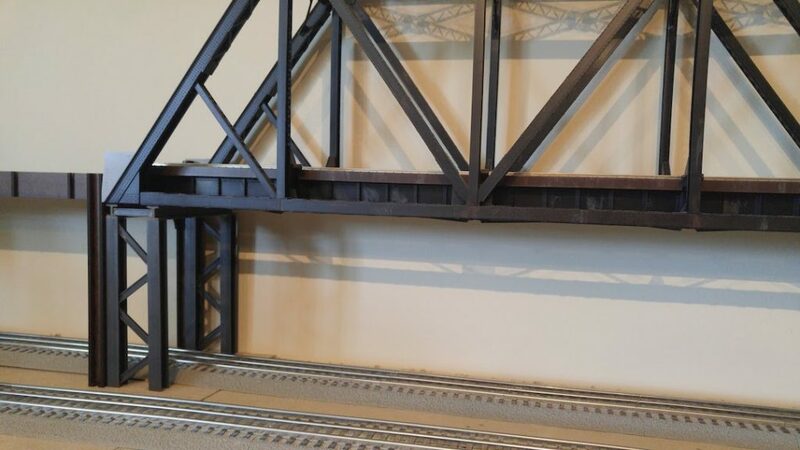 We will also be painting the BridgeBoss bridges and the ABS supports I built using black latex paint.